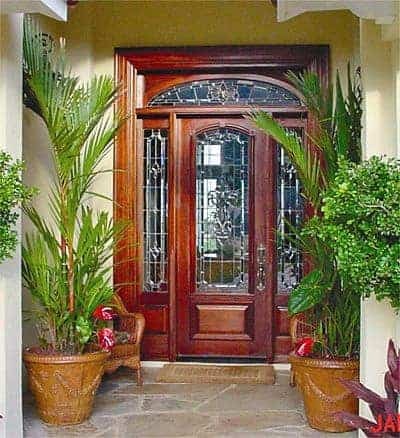 This lovely Front Exterior Entry is found in Hawaii. 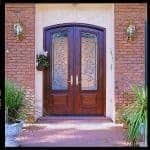 The owners chose a Mahogany 36″ x 96″ Style “E-2″ Door with complimentary Mahogany 14″ x 96” Style “C-2″ Sidelites and a 16” Rectangular Elliptical Transom. The Leaded, Beveled and Textured Glass was designed and built by Doors by Decora. The Exterior is customized by using 8711 Casing with 8387 Backband as a brick mold. The hardware chosen is Baldwin Kensinton 6950. The stain color is Red Mahogany.